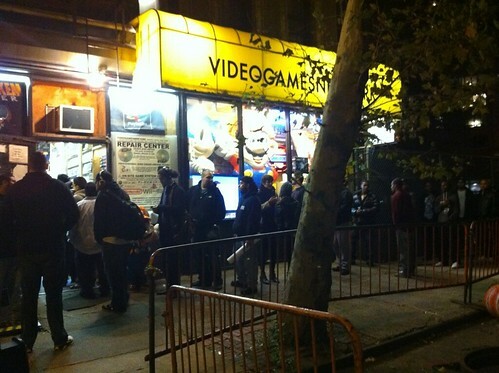 A line formed outside of Video Games New York on East Sixth Street last night (above: the scene at 7:30 p.m.), in anticipation of the midnight release of “Call of Duty: Modern Warfare 3.” The video game was expected to sell as many as 6 million copies in 24 hours, according to Bloomberg. According to DNA Info, a representative of the Department of Transportation will be at tomorrow’s meeting of Community Board 3’s Transportation and Public Safety Committee, in order to hear suggestions about where in the neighborhood bike share stations should go. EV Grieve notices flyers in several buildings maintained by Jakobson Properties encouraging fellow tenants to tweet about any upkeep problems that haven’t been addressed. Speaking of problematic apartments, a former East Villager tells Curbed about having once put up with “increasingly aggressive drug dealers on the block, another neighbor on crack who would pawn his wife’s jewelry creating endless and very loud daily dramas, insane former vet constantly complaining of beg bugs down the hall,” and, oh yes, a decomposing body next door.